This advertisement for vaccin.se, a Swedish website operated by the pharmaceutical company GlaxoSmithKline AB was in the window of a metro train car in Sweden. It alerts riders to the dangers of tick-borne encephalitis and advertises a vaccination against the disease. Tick-borne diseases are increasing in northern regions, including in Sweden. 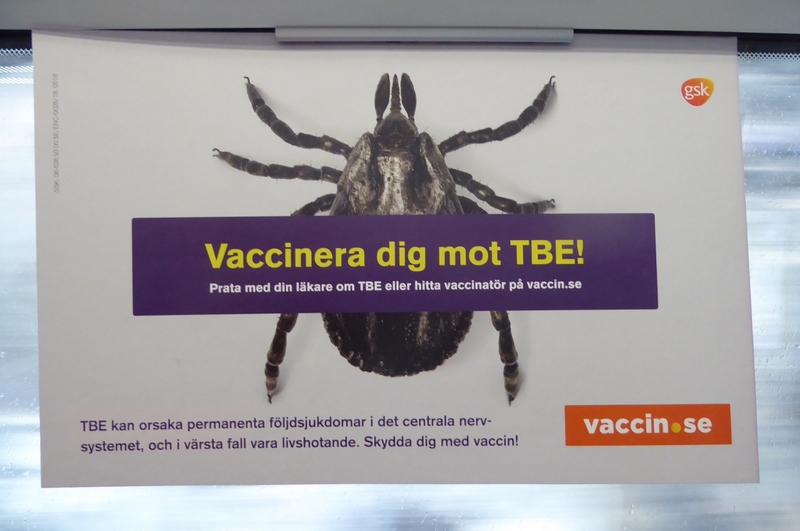 The image shows a tick and the text reads: "Vaccinera dig mot TBE! Tala med din läkare om TBE eller hitta ett vaccin på vaccin.se. TBE kan orsaka permanenta foldsksjukdomar i centrala nervsystemet, och i varsta fall vara livshotande. Skydda dig med vaccin!" Translation: "Vaccinate you against TBE! Talk to your doctor about TBE or find a vaccine on vaccin.se. TBE can cause permanent disease in the central nervous system, and in any event, be life threatening. Protect yourself with vaccine!"